Each unit consists of 10 screened cabins. Each cabin sleeps 4 people. Each unit has toilets and open air showers. 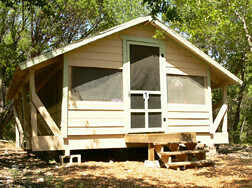 Hopi Cabin Unit shares its bathhouse facilities with Hop Lodge. Capacity: 40.